So far this sink has been awesome. Been it using for 6 months and not a scratch. The color is great and matches my granite countertops perfectly. My favorite part is the size and depth of this sink... it is huge! 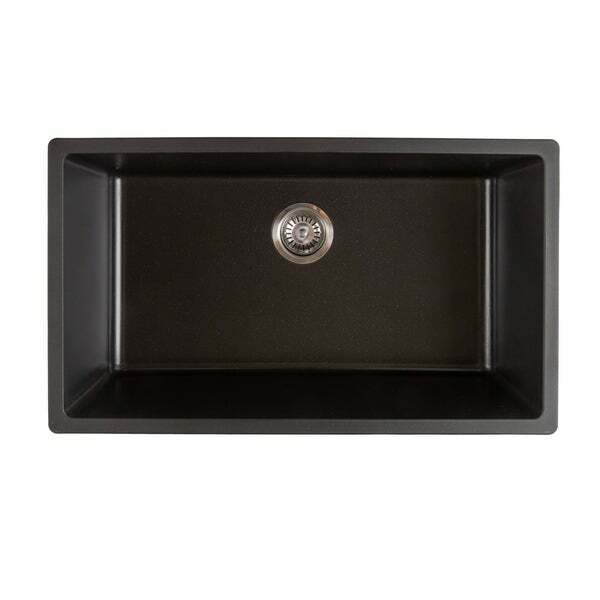 Refresh your kitchen with this durable and attractive natural quartz sink from Empire. This sink is designed to withstand any and all use. Natural sound deadening keeps the sink quiet when filling, and the ultra-smooth nonporous surface helps ward off bacteria, dirt and stains to keep the sink clean and sanitary. Maximum protection against heat (up to 650 degrees Fahrenheit), scratches, and stains. Quartz is one of the hardest, most durable materials - only diamond is harder than quartz. Microfine quartz material is nonporous with ultra-smooth surface that repels dirt food liquid, stains and prevents the spread of bacteria. Sleek corner radius ensures easy clean-up. Resilient Non-Fading Color: Sink is colored all the way through, with UV protection for a rich and consistent hue that will not fade or discolor over time. Pots, pans, and dishes may cause 'scratches' or marks on sink. Clean marks with warm water and soft cloth/sponge, or kitchen 'eraser' sponges. Limited lifetime manufacturer warranty. Well in this case, it’s a sink that will match my new matte black floor... even the countertop installer guys were in love with it. Plus I don’t see the dirt anymore... and if I can’t see it, it’s not there. My kitchen is looking fine. 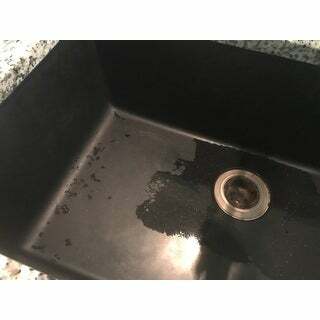 Sink looks great. Very good quality. Would give 5 stars, however when it arrived it was missing the sink strainer with it. On the positive side though, I called customer service and they were extremely helpful. He said they would send me one in the mail or I could go buy one and they would reimburse me 100% for the item. Very happy with the purchase. "Is the black sink a matte finish?" "Can this be used as a drop in as well?" 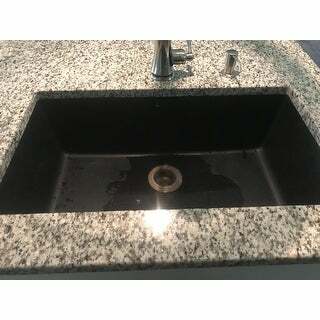 "What is the actual color of this sink?" "What is the interior measurement "
Approximately 16 1/8 inches x 29 1/8 inches x 9 1/2 inches high.